Researchers at Utah and North Carolina have created a controllable metal antenna that can change its shape, and thus the frequency at which it resonates, on demand. 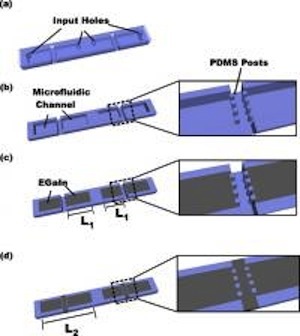 To fabricate the antenna, the researchers injected a conductive, low-viscosity metal alloy (eutectic gallium indium, or EGaIn) into a 51-mm-long microchannel that is divided into four segments. Two rows of posts placed perpendicular to the channel divide the inner and outer segments of the antenna. A thin, membrane-like solid oxide skin spontaneously forms on the metal surface that mechanically stabilizes the metal at the posts, preventing metal in adjacent segments from merging. The liquid metal remains stable as long as its surface oxide is not ruptured. At a length of 25 mm, the initial dipole antenna state, defined by the two inner segments, represents the shortest of three possible states. As the shortest antenna, it also has the highest frequency. In order to elongate the antenna, and thus decrease its frequency, the researchers applied a critical pressure on the liquid metal at one segment boundary. This critical pressure ruptures the oxide skin and squirts the metal between the posts to merge with one of the outermost metal segments. This process increases the length of the antenna and creates a second state at a lower frequency than the first state. By controlling the spacing between the posts, the researchers could control the pressure at which the oxide ruptures. To achieve the third state – the one with the longest length and lowest frequency – the researchers ruptured the skin on the other side of the antenna, allowing the liquid metal in the inner segment to merge with the other outer segment. Once the skin is ruptured, the metal flows extremely quickly – in a few milliseconds – due to its low viscosity and the short distance it has to travel. In his 1942 novella Waldo, Heinlein draws on the idea of broadcast power. The aircars (including the amazing broomstick speedster) use standard, rigid antennas to draw power. As the story progresses, the deKalb antennas mysteriously fail to function. When one of them is fixed by a "hex doctor", engineers go to investigate. "What!" put in Stevens. "You don't mean to stand there and tell me an old witch doctor fixed your deKalbs." "Not witch doctor - hex doctor..."
The skycar looked quite ordinary. Stevens examined the deKalbs and saw some faint chalk marks on their metal sides... "Watch while I cut in reception." Stevens waited, heard the faint hum as the circuits became activized and looked.